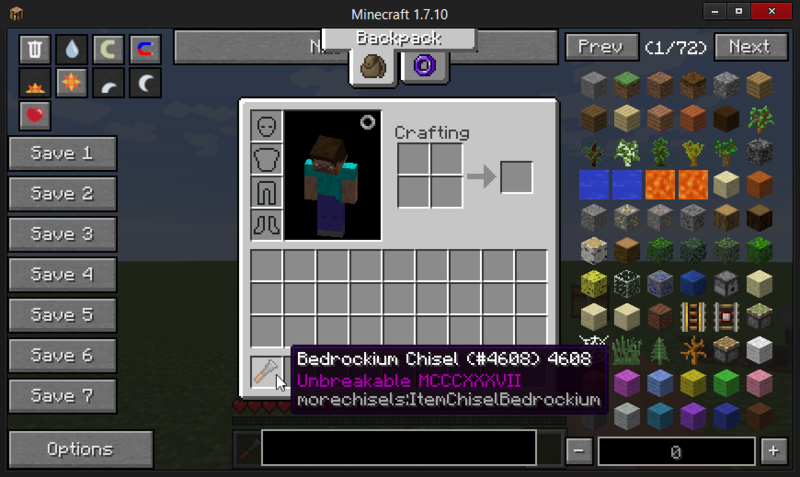 Addon for Chisel-2 that adds assorted chisels. Builds 21 and on have switched to the ChiselTeam fork of Chisel which can be found here. Gem Chisels - Configurable whitelist to scan the OreDict and create chisels for gem* items. Fluxed Chisel - Chisel that runs off RedstoneFlux. Requires the RF API to be present in the runtime environment. Bound Chisel - Chisel that runs off your Blood Magic LP network. Requires Blood Magic to be installed. Ironwood/Steeleaf Chisels - Chisels created with Twilight Forest materials. Bedrockium Chisel - Chisel with Integer.MAX_VALUE durability. See this issue for information. Also, generally speaking, if you go into #Chisel on Esper, most requests there end up with the devs notifying me. I prefer the first option, however. Sometimes Curse publishing is slow. You can find every download (Along with all my other projects) on my Jenkins. For full details, view our license. Distributor rights are automatically given to any user who wishes to include the mod in their modpack if the intent is not malicious and/or commercial. I reserve the right to change this section as needed.